Anyone who has been following this blog for awhile, or has read Totally Tangled (is there anyone out there who hasn't?!) has "met" Shelley (see page 46). 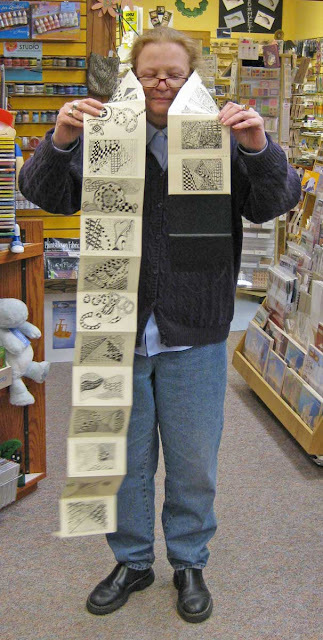 And as you can see from this photo, Shelley is one of the world's biggest Zentangle® addicts. 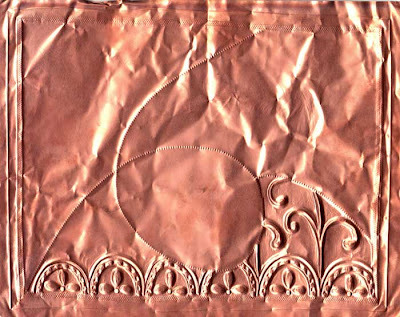 She has filled countless journals and accordian sketchbooks with her designs. When I first taught her how to tangle, she was at first resistant because she didn't "do anything artsy". But as soon as she saw her first finished tile, she was hooked! She's gone through her various color phases too - her blue period and green periods... where she adds in a bit of those colors. I think of Shelley as the poster-child of Zentangle. She's the perfect student too. I find that people who don't know they can do creative stuff, are much easier to teach and usually come up with the coolest variations. Also Shelley has a wicked sense of humor and she works in my store, Wingdoodle (in the background of the photo). So now that we have established that Shelley is cool... I want to ask for your help! This spring she was diagnosed with lung cancer and has gone through all the chemo and radiation and just when things seemed to be looking a bit brighter, all systems crashed. Shelley's in the hospital again and things are looking grim. Throughout everything she kept tangling. She filled quite a few sketchbooks in the waiting room and the treatment rooms and she has been pushing me to teach the other patients and write a book for them to use in the waiting rooms! But now that she is so sick, she doesn't even want visitors and I don't know if she is still able to draw. She's needs Zentangle more than ever! and we'll get it to her. It would mean the world to her to know we are all rooting for her. Thanks folks. 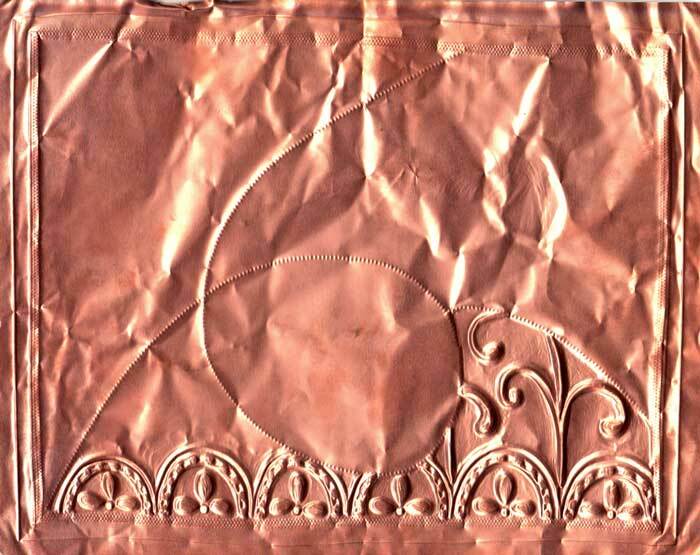 Ten Second Studio has a video on using Zentangles on metal! Aside from the fact that they are pushing the other Design Original books (Zentangle Basics and Zentangle 2 ) and not mine (boo hoo), it's a pretty good instructional video. Well, also, I don't think they read Suzanne's books, just used a few tangle instructions for inspiration, because they don't know ANY of the proper terminology (tongue in cheek here) and, horrors, they call it doodling... ah, amateurs. But these ladies really know their metal. If you haven't tried tangling on metal, you should! It is very satisfying and gives a bit dimensions to the art. I actually tried it last year. I had been looking around the studio for something else to tangle on and thought - AH, metal! I didn't get very far in my piece because I had to run over to Wingdoodle (my store) and tell everyone there that we needed to carry metal supplies! (Which we now do). I will force...ahem... request that all employees watch this video and play with tangles and metal... because it is just so freaking cool! Maybe I'll be inspired to finish my piece. And speaking of new books, Suzanne McNeil's new Zentangle 3 book is out. I haven't seen it yet, but it's about Zentangle and rubber stamps. Should be fun! In a recent post, I introduced Carole Ohl and mentioned she was working on a piano mural. Well, take a look at her blog to see how the creation is progressing - "Music to My Eyes" Piano Mural. Oh-mi-gosh. Is it selfish - and un-Zentangle-y - of me to want to own something of hers? If any of you folks are Amazon users, could you please, please, please, leave some ratings and reviews on the AlphaTangle page? 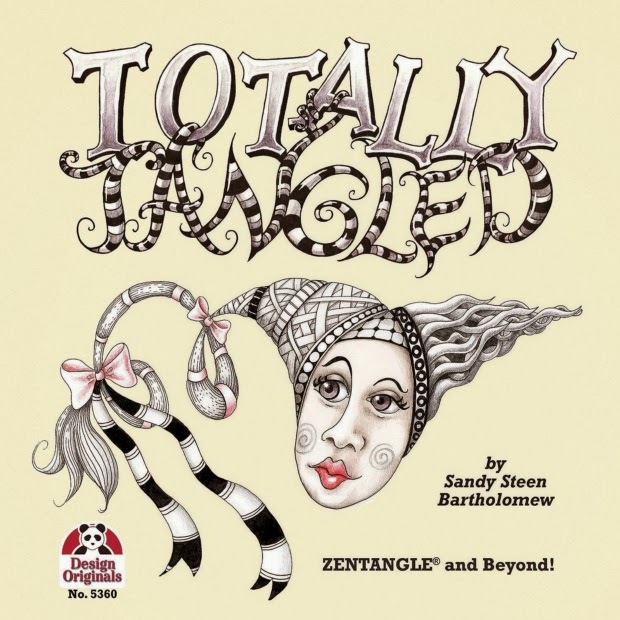 Totally Tangled has 17 reviews - pretty cool! And they are really nice things to read when I am feeling down in the dumps! Speaking of which! (Books, not dumps!) I am planning the sequel to Totally Tangled. Yes - shocking isn't it? I thought I poured every single thing I knew into that book and what more could I possibly write about... well, I've thought of a few things, but I would really like to know what you all would like to see in the next book? More tangles, more in-depth tips, projects.... Post your thoughts in the comments here. 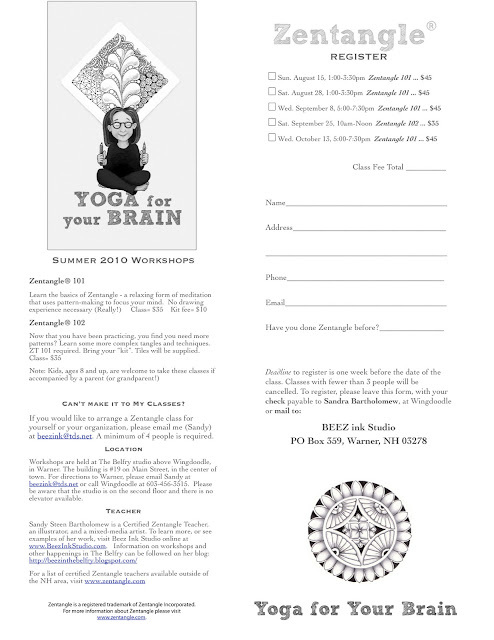 Also, I would like to know... who are the superstars of the Zentangle® world? 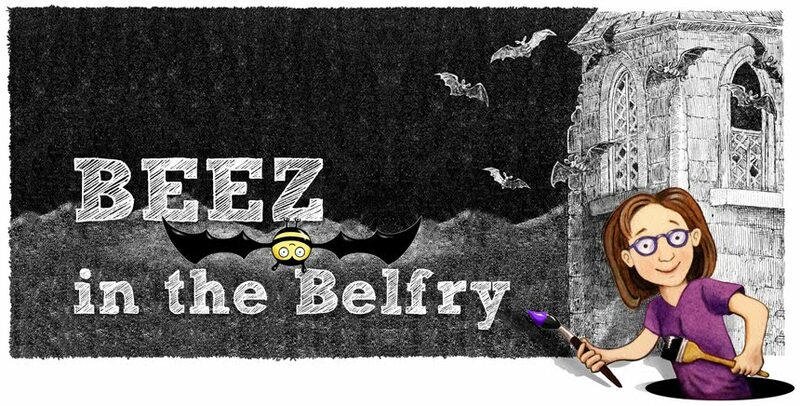 Traditional or cutting edge (we need to come up with a term to describe the Zentangle rebels... Zebels...Rebanglers... hmmm)? I have stumbled across some insanely amazing work being shown on Flickr and other blogs. But I'd like to know who have you discovered? (Post a link in the comments) And yes, if YOU are amazing - let us know!! !